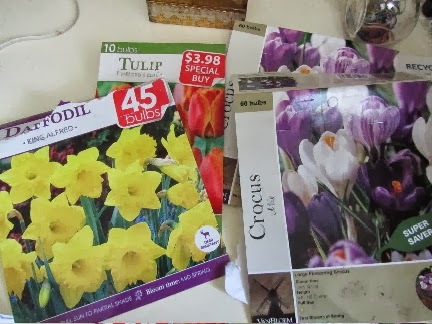 creative savv: I got a good deal on 175 spring-flowering bulbs -- woo hoo! I got a good deal on 175 spring-flowering bulbs -- woo hoo! Winter is hard on anyone with Seasonal Affective Disorder. And symptoms began early for many folks in the greater Seattle area, this year. We're in the midst of Fog-tober. It's been quite dark and dreary for about 10 days now. 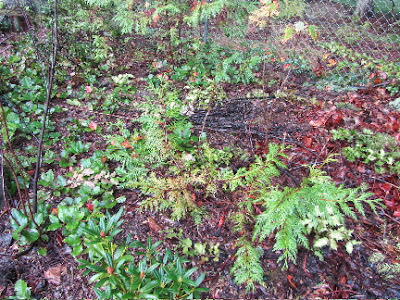 This is the area of the back yard, that I began work on this past spring. This is about what it looked like at the beginning. It lies along the side edge of the property, just along the gravel path to the wood lot. As it's an area in view from the house, and alongside a pleasant walk, I wanted to spruce it up, but keep it cohesive with more native plantings. I was at Home Depot a couple of weeks ago, and I found King Alfred daffodils and Darwin hybrid tulips for a decent price. The daffodils were about $15 for 45 (about 33 cents per bulb), and the tulips were about $4 for 10 bulbs (about 40 cents per bulb). Home Depot didn't have the mix I was looking for in crocus bulbs (I only wanted purple and white bulbs, no yellows, for this area). But, at a nearby garden center, I found bulbs marked down for end of season. I paid about $20 for 120 crocus bulbs (about 17 cents per bulb). This last week, I've been spending some of my time in the garden, cleaning up the ornamental beds and planting these bulbs, 175 in total. The yellow daffodils are planted under the river rock "stream". 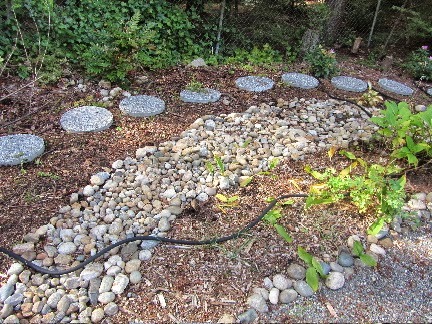 And the crocus bulbs are planted in the bare earth between the river rock and the stepping stones. 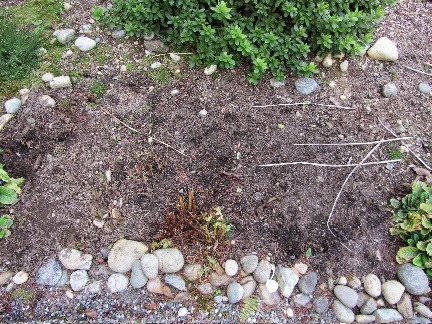 The crocus will be overplanted with hostas, as I divide my existing hostas over the years. (In my yard, crocus are done blooming by the time the hostas begin poking through the soil.) In addition, I have begun moving grape hyacinth to the sliver of soil right along the walkway, where I have a couple of hydrangeas for summer blooms. For the tulips, I have a spot in view of the master bedroom, where I plant about 10 or 20 tulips each year. I use only Darwin hybrids, as they tend to naturalize very well in my yard. This year I found these red and cream tulips. I think they're quite cheery! Making plans for late winter and early spring color helps get me over the hump with my SAD. I know that in just a few short months, my yard will be beckoning me to come take a look at it's cheer. I'll definitely be taking photos and posting a few. I'm already excited to see the color! Doing some math here: I paid $11.75 for 100 iris bulbs, which makes them $0.1175 each; tulips were $0.29 each. There were shipping charges, so I'll have to add those on and figure them out for a true number per bulb. It was actually a percentage, so it's pretty simple; it was 15% of the total. That makes the iris 13.5 cents and the tulips 33.6 cents--and there was no tax. Have you tried forcing bulbs? That could be a big help with SAD. I love bulbs indoors in the winter. I actually plant paperwhites as well, but I plant them outdoors here because my husband doesn't care for their scent (I love it, though, or I would grow them inside; they are quite strongly perfumed). They come up immediately here and they return every year, usually blooming in November. The ones I have in my backyard are up, but the flowers aren't up yet (they come up after all of the leaves). The ones I just planted in the front yard (6 inches down) just recently are starting to poke through the dirt already! They'll bloom the week before Christmas this year. Tulips are a one-time deal here, unless I'm willing to dig them back up and refrigerate them every year. We're too hot for them to naturalize here. Most of what I'm planting should come back every year, though, and I love that, because in a few years I'll have double the number of flowers. I suppose you could really look at that price per bulb over several years, really, because they will come back each year. How lovely for you that it is cold enough for the tulips to naturalize! I absolutely love tulips and if I lived somewhere colder I would put a lot more tulips in every year. Mine are in the refrigerator now; I cannot plant them for 10 weeks still. I'm so glad that you were able to get some bulbs! I think they're worth every penny! I'm more than willing to spend money on flowers, especially spring flowers, even when income is tight. They provide such beauty and visual relief when everything looks gray. I wish I had more energy and time to plant bulbs, so I could take advantage of ordering them in bulk. Maybe next year. Your price per bulb is extraordinary! And how wonderful that you can do paperwhites outdoors! I plant just a few indoors each holiday season. And I have my amaryllis bulbs indoors, which keep coming back. Hmm, I'll have to look into forcing other bulbs indoors. I could even just keep bulbs in a pot outside, and move inside after 2-3 months, and see what happens. Hyacinths are supposed to be good for forcing. I have also seen muscari (grape hyacinth), tulips, and daffodils forced before. I know you read my blog so you probably saw my post titled "1000 Flowers" where I wrote about where I purchased my bulbs. The first time I planted from this company I had ordered 500, I believe, and after the 10 weeks of having them in the fridge, it was January before they could go out (now I make sure to have them send them earlier). My third baby was due on the 7th of January. Thankfully he wasn't born until the 27th! I was out there every day planting bulbs, a full nine months pregnant, and then when he was just a few weeks old, the tulips were up! (February here!) My husband said he knew it was finally time for him to be born when I stopped working in the garden 2 days before his birth. . . . Brandy, that's a funny image of you out there planting bulbs, nine month's pregnant! I do like Van Engelin's prices on bulbs. I am thinking now that even if I don't have the spot totally ready for a large order, I could split an order with a couple of friends. But actually, it's fairly easy to fill a spot with a lot of bulbs. With the ivy that I've cleared so far, I could probably get a couple hundred bulbs in there already. I think I'll try indoor forcing of hyacinth. I love their fragrance, and having them in the house would be a beautiful reminder that spring is just around the corner. Thanks for the suggestion! Your bulbs sound lovely! I agree with Belinda, please show a picture of them in all their glory in the spring! Doesn't a good sale make you smile? I spent way more time than I had intended to at Penney's today. I stumbled upon a 97 cent sale--so I bought scads of shorts in different sizes for my daughter, shorts for my hubby, and t-shirts for myself. They had very little to choose from for my son, but still, what a deal! Oh I am so envious of the sale table you found at Penney's!! I may have to make a stop at the mall on Thursday, when I'm out that direction. I'm glad that you stumbled upon the sale, and were able to take good advantage!! Wow... those will be beautiful next spring. I lost a bunch of my bulbs a few winters ago. I'm not sure what happened, but I think it might have been too dry and they all died. Sigh. I just can't bring myself to haul the hose out to water during the winter. BTW - does anybody know about how to care for iris over the long term. I've got a bunch of them, but some have totally stopped flowering. Not sure if they're not getting enough water, or if they need to be thinned or what. Anybody have any ideas? My grandmother had a lot of iris in Salt Lake City. He best stand of iris was actually in a spot that received a couple of hours of partial shade in late afternoon, in addition to the rest of the day in bright sun. This was also on a hillside, so it drained well. And she watered this spot a few times per week. The other areas of iris that were in full sun all day would peter out after several years. I think in extreme heat and sun, all summer, iris can get stressed. Your's probably didn't need water in the winter.But maybe heat and lack of water in late spring/early summer did them in. Or, you could have had a pest. Or they may have needed dividing for a while (you do have to divide iris every several years). Or, the soil may have been too soggy (iris like well-draining soil, and they like to be planted so that you can see the tops of the rhizome just above the soil level). Luckily, iris are easy to get started again in sunny areas. It would only take a few rhizomes to start a patch, and you can do that fall or spring, I believe. I haven't had any problems with iris, so I'm not sure that I will be of any help. I'm just happy that the deer don't like them. Are they getting enough sun? They do better in the sun. Too bad that you don't live closer. I have a lot of daffodils that I could share with you. Have you looked into flower exchanges? We share among ourselves at work all of the time. Maybe there is someone on freecyle that has flowers to share that you want. Nothing cheaper than free. You do have some beautiful daffodils on your property! Plant exchanges can be really fun. I participated in one at the library several years back, and our garden club hosts one every few years. I'm also thinking of ordering wholesale quantities and splitting with a couple of friends, for next year. yes, free is definitely my favorite price!! Wow, I can't wait to see them! I hadn't thought about planting bulbs to help with the gloomy weather, but that's a fabulous idea. I'm in the PNW also! Hi neighbor! I'm excited, myself, for them to come up. Going outside to check on the status of the bulbs gets me outside, even on cloudy or rainy days, and that seems to help with winter blues, for me. Also, indoor gardening helps. I brought a table from the deck inside last week, and set my plants on it in front of a window. I've got my Amaryllis bulbs, my pot of basil and a Christmas Cactus on it. I took cuttings off of an African Violet, and am hoping some root and I can have more flowers in the house. I just bought 4 dozen bulbs and I thought that was a lot :) Here, the best planting time is early to mid-November. I will be spending the dark of winter this year planning a new garden, which I haven't done before. Planning your garden will be so fun in the dreary winter months. Something to do and think about. And your bulbs will give you that real hit of spring, to help motivate you to get out and plant your new garden!